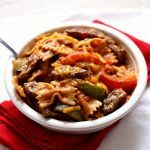 All the delicious flavors of fajitas in a pasta dish! Steak is cooked with fajita seasonings, pasta and tender, but not overcooked, bell peppers. Sour cream is stirred in to add a creamy element to the pasta dish and ties everything together. Make this recipe is just minutes with your electric pressure cooker. In a small bowl combine the chili powder, paprika, garlic powder, cumin, oregano, sea salt and pepper. Set aside. Slice your onion into thin, half moon slices. Turn your Instant Pot to the saute setting and let it heat up. 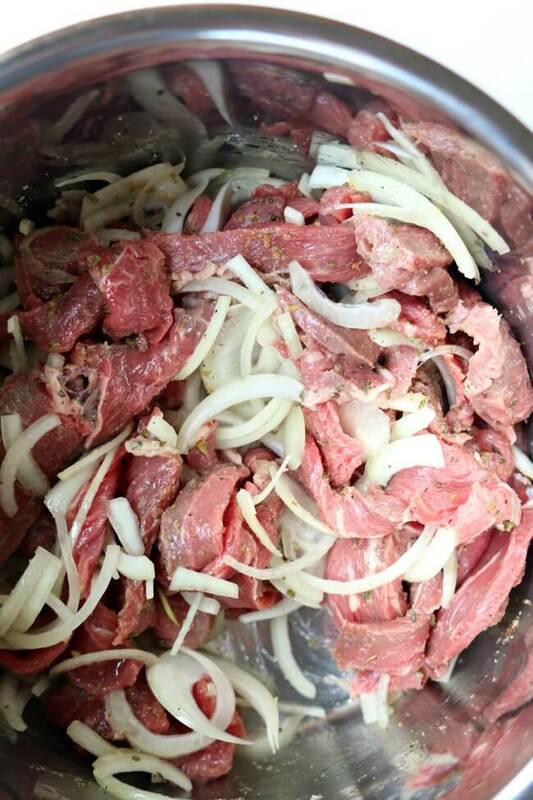 While it is heating up, cut your steak into thin quarter-inch strips. This way the steak will be distributed evenly throughout the pasta and will cook more tenderly. When the Instant Pot says HOT on the display add in the oil, steak and onions. Sprinkle in half of the seasonings. Sear the steak pieces for about 3 minutes, stirring every minute. Add in the beef broth. Add in the pasta. Stir a bit. Add the crushed tomatoes on top, do not stir. Core your peppers and cut them into long slices and then cut the slices in half. This way they will be more evenly distributed throughout the pasta. Pull out a long piece of foil, about 20 inches long. Place the peppers in the middle of the foil. Then fold up the edges of the foil and crimp together to create a foil packet. Place the foil packet on top of the tomatoes. This will cook the peppers to perfect doneness and prevent them from getting mushy. Cover the Instant Pot and secure the lid. Set the valve to sealing. Set the manual/pressure cook button to 4 minutes on high pressure. When the time is up let the pot sit there for about 5 minutes and then move the valve to venting. Remove the lid when you can. Use tongs to remove the foil packet. Carefully open it with hot pads. Stir the peppers into the pot. Stir sour cream into the pot. Stir the other half of the seasonings into the pot. Scoop pasta onto serving plates and sprinkle each serving with 1 Tbsp of grated cheddar cheese.